Can Flashing Lights Actually Harm Pedestrians? | Hupy and Abraham, S.C.
Can Flashing Lights Actually Harm Pedestrians? While driving on Wisconsin Avenue in downtown Milwaukee, Attorney Michael Hupy witnessed something routine, yet potentially dangerous. Attorney Hupy observed another driver stop at a marked crosswalk with flashing lights. On face value, that seems like a good thing. What’s wrong with a driver stopping at a crosswalk in accordance with state law? But just a few moments later, Attorney Hupy saw that same driver approach another marked crosswalk. The next crosswalk did not have flashing lights and the driver did not stop. Do flashing lights confuse people as to what the law actually means? Do the flashing lights cause people to think they only need to stop if the crosswalk has flashing lights? How often do others do exactly what that driver did? The purpose of the flashing lights is to emphasize the importance of the law. Typically, flashing lights are seen at crosswalks that are particularly dangerous. While it makes sense to emphasize the importance of yielding to pedestrians at the busiest intersections, does it discredit the marked and unmarked crosswalks that don’t have flashing lights? Far too many drivers either don’t know, or don’t care, that state law requires them to yield to pedestrians at all corners and crosswalks. The last thing we need to do is create confusion on what people are required to do. Everyone needs to work together to save pedestrians’ lives. 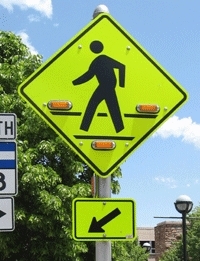 Drivers need to be educated, or re-educated, about laws concerning pedestrians and crosswalks. And, as Attorney Michael Hupy stated in his letter to 19 metro-Milwaukee police chiefs and mayors, law enforcement personnel need to enforce those laws and issue citations.